Predicting is one method that can be used to teach reading. Predicting involves previewing the text to anticipate what will happen next. The thinking processes involved in predicting assist students in making meaning (Block, Rodgers, & Johnson, 2004:5). Predicting is using knowledge of the subject matter to make predictions about content and vocabulary and check comprehension; using knowledge of the text type and purpose to make predictions about discourse structure; using knowledge about the author to make predictions about writing style, vocabulary and content. A prediction is an educated guess about something that will come later in the text. The Predict Strategy is a simple but powerful way to help you connect what you know with what you are reading. Just as a detective looks for clues to solve a mystery, you can find clues in a text about upcoming events and themes. Making predictions while you read will help you find meaning in a text. 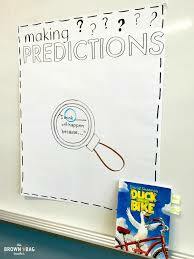 When you make a prediction, you engage with the author's clues about what is important in the story, poem, speech or other nonfiction text. Plus, it can be fun to find out whether things turn out as you expected. As you read, stop every once in a while and think about what the author has written. Check the text and images for clues about what might be important. If you're reading a story, try predicting what you think will happen next. If you're reading a poem, speech, or essay, try predicting the themes and main ideas the author will emphasize. Belum ada tanggapan untuk "PREDICTING METHOD IN READING"